The Aquarius Girl is a sweet, direct child. It is impossible to catch her mood, to understand the cause of actions. Every day she sees as a discovery, she is amazed to observe everything that is happening, like Alice from the "Wonderland". Communication with her is a holiday and a delight. The girl has her own opinion on any occasion, in her head a lot of bold fantasies and ideas. You just need to love Aquarius with all the quirks of a difficult nature. A bright personality does not recognize borders and frames, in any way tries to achieve the desired result. Has a strong will, it attracts the future, and not boring details of the present. Has its own circle of interests, never follows the general rules. She fiercely defends her own opinion, possesses the gift of persuasion. There is no doubt that the surrounding people sooner or later will be imbued with confidence in her choice, will begin to follow her. Aquarius is an air sign, the representatives of which differ in their freedom-loving disposition. The dominant element determines the character traits: impetuosity, mobility, curiosity. The girl tries as brightly as possible to paint dull everyday life, collects unusual things. Likes to spend time with friends, find a common language with a variety of people. The Aquarius girl has a wonderful taste, she is an avid fashionista. She loves to dress herself, gives valuable advice to friends and acquaintances. Can become a designer or a stylist. It has unique actor’s data and rich imagination. She likes to shock the public, attract attention. The girl awaits the great future of a famous actress or writer. Uranus — a planet that protects Aquarius, has a significant impact on the character of the representatives of this sign. The girl from the cradle has a bright personality. With desperate determination she defends her own point of view. It shows a rare stubbornness if it is forced to engage in a boring affair. The girl’s head is full of original ideas that deserve attention. Girlfriends can take offense at her as much as she likes, but she will not take part in a boring game. She will come up with a grandiose theatrical performance, in which for each friend there is a suitable role. The Aquarius girl knows how to communicate. Easily and directly leads new acquaintances, can support any conversation. Talently tells funny stories, inspires with her ideas. With the girl is always interesting, so people are drawn to her. For Aquarius, the most terrible test is loneliness. She loves and appreciates friends, often sacrificing for them her own personal life. The Aquarius girl has a feeling of compassion. Understands the mood and emotions of people around. She tries to help everyone at least with a kind word. She is especially sensitive to her parents, cares for her brothers and sisters carefully. The baby feels deep pity for the weak creatures, dreams of creating a shelter for homeless animals. A girl who has the ability to think outside the box can suggest the right solution in a difficult situation. Often, her participation in the affairs of close people acquires a public resonance. Can organize a rally in support of a classmate, unfairly oppressed by teachers. Girl Aquarius from early years knows what to strive for. While her peers are busy with children’s games and frivolous hobbies, diligently studying books, watching scientific films. Her rich imagination paints a rather bold picture of a future life in which she is a universally recognized personality: a scientist, an actress, a writer. Even if, it is not possible to achieve significant heights in a career, she will successfully apply her knowledge in everyday life. Can organize a children’s theater circle or become a good dressmaker, to which all acquaintances dream to get without exception. Parents should learn one thing — it is impossible to dissuade the daughter. If she set a goal, then it will certainly achieve the desired result. 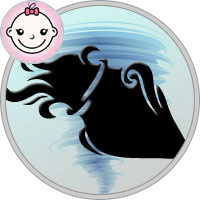 Child-Aquarius with great pleasure studying the world around. The girl is interested in every subject in the children’s room. She likes to communicate with strangers, especially noisy games with peers. With great interest, she considers pictures in books, she loves to collect turrets from cups. The girl is not indifferent to beautiful clothes, and she makes a wardrobe in accordance with her taste. She comes up with original outfits for dolls. In school-days, the girl is most likely to achieve accurate subjects. Teachers like its ability to work diligently, although sometimes there are conflict situations. The obstinate student will defend her point of view to the last, do not hesitate to apply to higher authorities. The patronage of Uranus explains its activity and unpredictability. With pleasure, she participates in school amateur performance, offers original ideas and most importantly — knows how to implement them. The truth can easily quarrel with classmates because of costumes and props, will persist in her choice and as a result will refuse to participate in the play. Teenager-Aquarius — a rebel, not recognizing the comments. A girl can listen to the instructions of her parents for a long time and even agree with them, but she will necessarily do it her own way. She has her own opinion, it is the decisive one. It is possible that she decides to rest from all and wants to go on a trip. It will take a lot of effort to dissuade her from a rash act. Parents should patiently instruct their unpredictable daughter on the true path. Any emotional ups and downs can aggravate health problems. The girl has a weak cardiovascular system and joints. In the education of the Aquarius girl, attention should be paid to the weak points of character: unpredictability, quick temper, stubbornness. A bright personality attracts attention, people are drawn to it. But the girl is too categorical, always defends her own point of view. She should listen more closely to the opinions of others. Parents should be the best friends of their daughter, but not strict teachers.